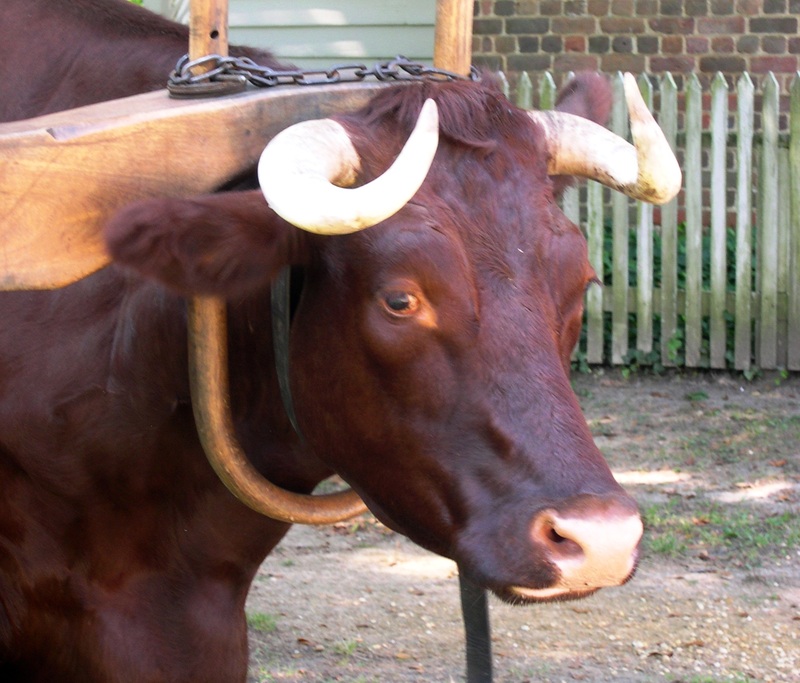 I photographed this yoked ox at Colonial Williamsburg, Virginia, in October 2005. Years ago Daddy showed me this quote, and I liked it instantly. It captures perfectly the mysterious appeal that draws so many animal lovers to all sorts of creatures. We watch in fascination as each species moves in its own unique sphere, possessed of capabilities that enable survival and usefulness to the environment. Anyone who watches National Geographic specials about animals soon learns that nature can be harsh and even cruel. This is why Beston’s description of animals as “fellow prisoners” seems so apt. Whether small and agile or large and mighty, each is subject to forces beyond its control, part of a large and magnificent living tapestry. We may be captivated by their tremendous strength, exotic beauty or astonishing grace, but perhaps it is this common bond of earthly travail that binds us most to the animals. I find it difficult to watch any creature for very long without feeling some degree of sympathy for it. “Caught…in the net of life and time,” we are in good company, surrounded by more varieties of life than any human mind could imagine. Today I hope you will enjoy sharing a few minutes of your attention with at least one or two of these delightful companions. Lovely indeed. You’re such a good writer, Julia. Thank you Alys, so are you! Julia it’s been about 5 years since I visited the zoo. Where I work at ( Dupont) is also a wildlife preserve I think( I seen the signs lol. You find racoons, skunks, groundhogs and plenty of” bambi”.. These days I”m fascinated by my 2 dogs and their different personalities.. The older one taught the younger one” habits” You say the words “Go” and Chicken” and they” fly over the coo coo nest and ” Coo Coo for Coco puffs I digress..
Raynard, I think dogs are the most interesting of all the animals, and that’s saying quite a lot. I am glad you have some dogs in your home to provide comic relief! They are a great way to stay young at heart (and active too). Good morning, Julia! What an interesting thought, that they are caught with us. The yoke makes a difference for me, in interpretation. Thanks for sharing this concept. Thanks Susan. When I was trying to decide what photo to use for the quote, the yoke was the thing that made the difference for me too, but the expression in the eyes of the ox was part of it too. Something about all the bovine animals has always been touching to me. Perhaps it’s partly because Matt has now had two different bovine prosthetic valves beating in his heart. BTW it’s often me against the mosquitoes, too – I must admit I’m not sure I’ve ever felt any sympathy for them. Collectively they have left me with way more damage than probably any other animal ever has. Were it not for biting insects, though, I might never be able to talk myself from coming in from the yard or garden – I’d be out there wearing one of those forehead flashlights! 😀 I appreciate your kind words about the post. I used to LOVE watching my cats cleaning their faces. Pasha was fun to watch too, though dogs (or maybe just male dogs?) are a bit less delicate about it, so the “GROSS!” factor was higher. 😀 I say hello to wildlife all the time, everything from toads and lizards to birds and squirrels, and though they probably get nothing at all out of it, I enjoy it tremendously (though anyone who might pass me probably thinks I am nuts). I especially like it when the squirrels are outside my glass door at the patio, since they are much bolder– they seem to understand there is a barrier between us — and I can get a real close up look at them. They are so cute that I don’t mind if they ate all my tomatoes. I’m like you, I prefer not to see the blood and gore of nature, though I never forget that it’s there. We are lucky that we don’t have to see it too often. Lovely post and quote. I love all creatures…except spiders, they scare the bejeebies out of me. I try to view them as a creature in it’s own right but sheer terror gets in the way lol. I don’t mind the non-poisonous spiders but I’m terrified of getting a bite from a nasty one. But poisonous SNAKES are my most dreaded creatures. They are repulsive to me, even though I sort of feel sorry for them because they are so universally hated and feared. I have never understood how people could want to keep pet pythons or boas either. One of the things I loved best about living in Hawaii was that there were no spiders and snakes! I agree with you about snakes…they’re gross and scare me. Julia, I’ve thought about what I want to say regarding Jack, our Boykin Spaniel, a stray, and picked up by animal control, saved by a rescue agency, days before being euthanized. I told him that his 90 day warranty is up and it’s official, he’s ours and we’re his. The most difficult challenge has been his desire to be FREE, to be on the other side of that fenced yard, to walk without a leash. We don’t know his story, but as much as we love him, we can only hope that with time our love will be stronger than “being caught” ! Sheila, some dogs just seem born or bred to be “runners” and it’s very hard to keep them inside any sort of fence, let alone on the end of a leash. It can feel almost cruel to keep an animal confined when it wants to be free to roam, but we don’t have much choice about that. I wish you the best with Jack. Maybe in time he will come to understand the benefits of living the suburban life! 😀 In any case, at least you are giving him the chance to try it.